How much is that doggy in the window? The one with the one-of-a-kind skin? Defense of the Ancients 2 uses couriers to pick up loot and cart it about the map so your hero doesn't have to, but it turns out that the courier can be worth some pretty sweet real world loot in its own right. An Enduring War Dog courier - worth about $11.99 in the store - sold for $38,000, and for why? Because it was pink and had an Enduring Flame particle effect, that's why. Pink is big business in DotA 2. Time was, it was a rare randomly assigned effect, something that you didn't often see but which you could, theoretically, pick up for yourself if you got really lucky. Those days are done, and now you can only get a courier with one of ten preselected colors. Guess which color isn't on the magic list? Plus the Ethereal Flame - oo, sparkly - is itself a rare effect, something you might get 1 or 2% of the time from a treasure chest drop. 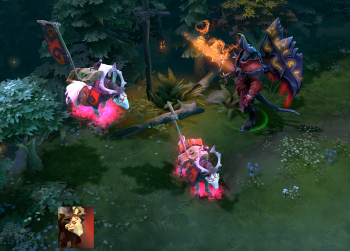 Rare effect plus color you can't get any more equals Ridiculous Cash, at least in DotA 2's world. The vendor put this auction up on Reddit just a day ago, with a reserve of $38,000 and an ending date for the auction of 16th November. In less than 24 hours, the reserve had been met. "I think [your buyout] is lower than peoples' expectation," said one Reddit commentator. If $38,000 for a glowing pink mutt is low, the Ancients only know what high is.